Star Wars The Force Unleashed II's official website is now live bringing with it this fancy new art. We also learn a bit more about the game. In the sequel to The Force Unleashed, due out Oct. 26, players once more take on the role of Darth Vader's fugitive apprentice, StarKiller, six months after the end of the first game. The time around perhaps clone StarKiller is trying to reunite with his love, Juno Eclipse, and discover his own past. All the while Vader is "attempting to clone his former apprentice in an attempt to create the Ultimate Sith warrior. 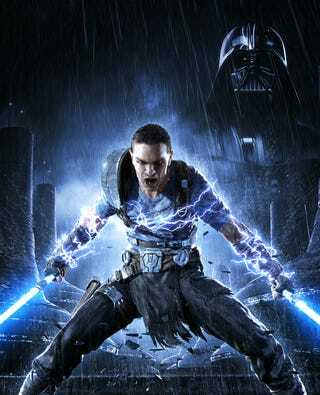 The chase is on – Starkiller is in pursuit of Juno and Darth Vader is hunting for Starkiller," according to LucasArts. Slightly confusing, but maybe that's an attempt to not to spoil the first game. Star Wars: The Force Unleashes II also brings with it new powers, like the Mind Trick, and the ability to dual-wield lightsabers.